Because some families can't be photographed in under an hour. I should know. Mine is one. My daughter Raeven is a teenager who would most likely talk your ear off about anime and K-Pop the first half an hour. My other daughter Skyler will dab for another 30 minutes before showing you her colorful animations on Framecast. My husband will perhaps enthrall you with his many hobbies. All in all, it'll be three hours in before we get anywhere close to who we are TOGETHER. After almost ten years of photographing families and weddings, this is my realization. That some families, like mine, require a more "dig deep" approach. And it's an approach I love. Documentary photography is not just a series of snapshots and candids. 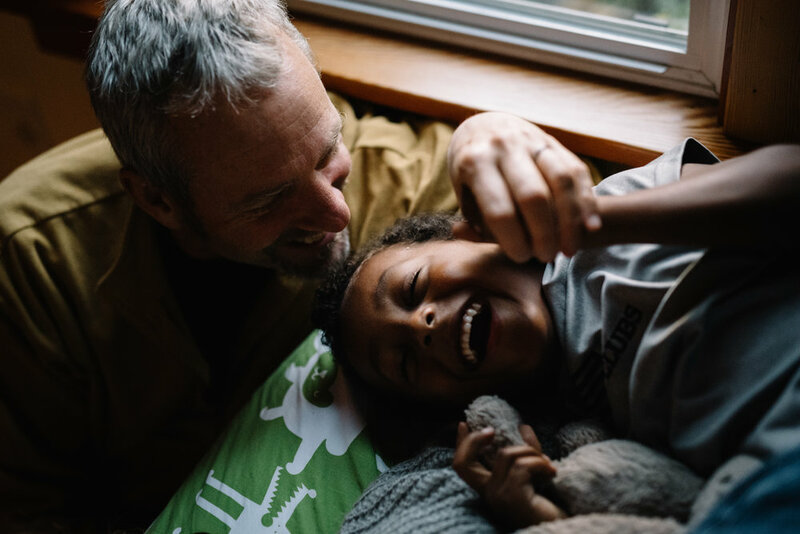 It's purposeful framing and intentional composition in the capturing of unscripted moments that ultimately paint a picture of your family's togetherness. Without the pressure of limited time or having to "dress up", our sessions allow you the freedom to be yourselves and for photography itself to take a backseat. The only rule? Zero screen time (which has to apply to parents as well!). From the time I arrive until the last little head hits the pillow, we will do whatever it is families do together, and I will capture the beautiful rawness of it all, be it eating breakfast together, playing hoops, shopping for groceries, doing homework, playing KATAN, taking a swim in the river or even just hanging out reading a book. At the end of the day, the only thing left will be the wonderful memories made. If I do my job right, nobody would remember that a photographer had tagged along to capture it all! Imagine there's a planned power outage. What would you do for eight hours? This is the gist of what a documentary family session will be about - just family spending a day together with one or two planned activities. The shooting approach is wholly unscripted and requires at least eight hours for the kids (and parents!) to be comfy in front of my camera. I have only one rule - that the day be screen-free (hence the power outage scenario). All documentary sessions are shot at your home. A lifestyle session is shorter and because of the time constraint (usually 1-2 hours), we will require a little more structure and posing. I usually shoot these on film if it's a nice, sunny day or if your home has enough light. Most lifestyle sessions will take place at your home. Either approach yields natural, meaningful photographs that your family will cherish for a long time. Ready to book? Click here to proceed.